Sandy Henshaw is a London-based beauty therapist and skincare expert. Sandy offers her therapies in Highgate, North London. An interest in the approach of all natural therapies led Sandy to complete a diploma in Aromatherapy (ITEC), combining the latest and most effective anti-ageing and skin rejuvenation techniques with individualised instruction on skincare. As a beauty therapist, Sandy offers a range of therapies from holistic massage to advanced aesthetic treatments to help combat the natural signs of ageing and to address problematic skin conditions without the use of invasive treatments. With over 25 years with cosmetic companies such as Clarins, Lancôme and Elemis Sandy became convinced that taking care of the body extends far beyond the simple application of creams and lotions. Sandy has now developed a range of therapies to meet the needs of each individual skin concern be it tension in the body, anti-ageing or problematic skin. 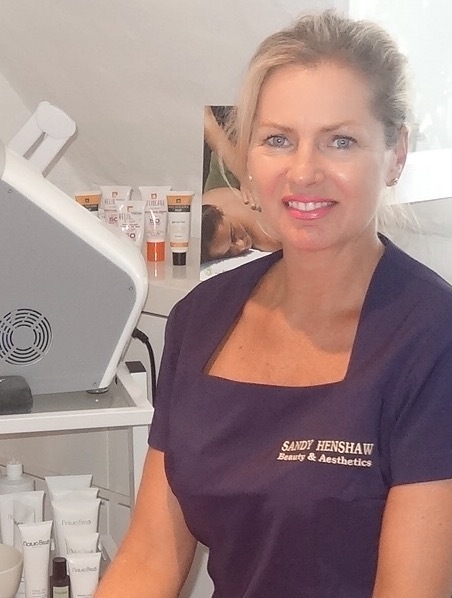 Sandy Henshaw Beauty now offers Advanced Anti-Ageing therapies with Natura Bisse, Dermalux LED, Caci Synergy with LED, Eyelash Extensions, Lava Shell Massage and Waxing into her practice. Sandy’s experience and extensive training has enabled her to adapt her treatments to meet the needs of each individual. Your Experience is our Passion!